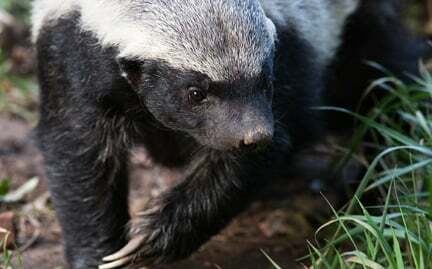 Honey badgers are wide-ranging nomadic animals. They are members of the weasel family, related to skunks, ferrets and otters. They are curious animals that rarely show fear and have a scent gland at the base of the tail that expels a smelly liquid to mark territory or to warn others to stay away. They use their quickness to ambush much larger prey and even attack poisonous snakes, relying on their thick coat to protect themselves.